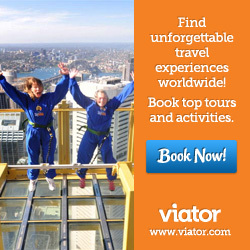 Try the Tower Bridge high level walkways for a new perspective on this internationally recognized icon of London. The structure of the bridge – part drawbridge, part suspension bridge – was considered absurd and even tawdry by some early critics when Tower Bridge was created in the 19th century. Yet today it’s been judged one of Britain’s best buildings, loved by locals and visitors alike. Seeing the drawbridge section of the bridge rise is a rare treat – especially if you happen to be in a boat on the Thames when it happens (not so thrilling if you are needing to cross the river in a hurry) – yet it’s raised at least 1,000 times a year. And, surprisingly – although the tall-masted sailboats, a large river cruise boats and red-sailed Thames Barges have to request an opening 24 hours in advance – it’s free. At least 40,000 people cross Tower Bridge every day – on foot, in vehicles and on bicycles. But, unless they’ve been burying their noses in guidebooks or tourist oriented websites, not many of them know about the exciting tourist attraction hiding in plain sight, high above their heads. The two high level walkways were designed to tie the two towers together against the opposing stresses of the suspension sections. Like most people, I always thought that was the beginning and end of it – a structural device and little more. But, in fact, these horizontal “bars” were also always intended as open-air (though caged) walkways, offering remarkable views of the Tower of London and the City of London from 138 feet above the river. Because the walkways quickly became a haunt of petty criminals, street walkers and pickpockets – real Oliver Twist territory – they were closed to the public in 1910. They remained closed until 1982 when a fee paying public was allowed to climb up for the view. Few people did though. At least 40,000 people cross Tower Bridge every day – but not many of them know about the exciting tourist attraction hiding in plain sight, high above their heads. In 2014, a new attraction, a clear glass flooring, was added to the walkways. And, if you haven’t yet visited, the dramatic new view of London, will surprise and delight you. The walkways are totally safe but there’s no mistaking the frisson you’ll probably feel walking across them. 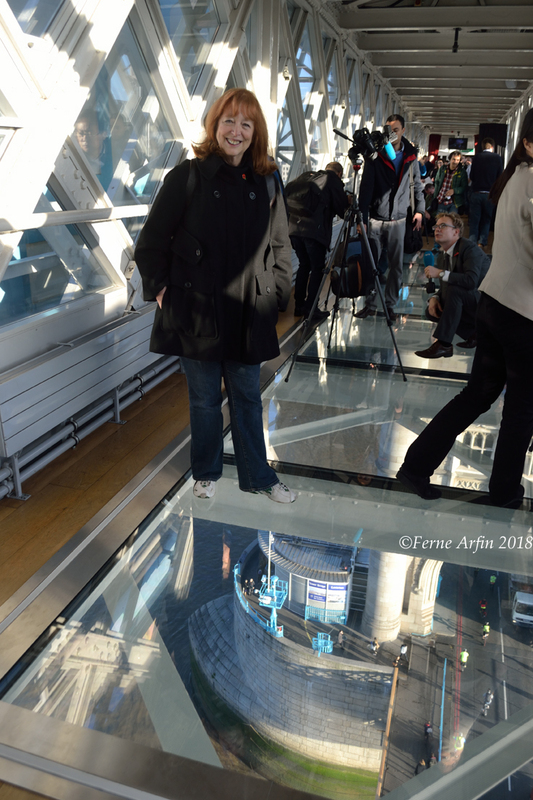 At the press opening, I joined the guests to cross the glass walkway. are hard to beat for sheer excitement. The glass floors for each walkway are 36 feet long and 5 feet 10 inches wide. They are made up of six glass panels, each weighing almost 1,200 pounds. They’re supported by a carbon steel framework. Under the frame, the original steel lattice structure of the walkways has been preserved – mostly for its visual reassurance, I imagine. Those original crisscrossed beams give nervous visitors a little extra psychological help when they step onto the glass floor. The glass is also patterned with dots to give it vertigo-reducing substance. official opening in late 2014, there was a certain amount of trepidation before the first journalist stepped onto the glass. Of course, in no time at all, we were scrambling across it for a better view of the traffic and pedestrians whizzing along – and the birds flying – beneath our feet. Walking on the glass walkway can give you wobbly knees. 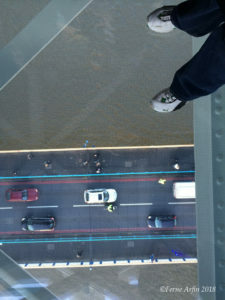 Those are my feet, just nervously stepping out onto the glass, with the traffic flowing beneath me. But, be warned, if you really are prone to vertigo, you might not like walking on the glass. Not to worry – you can cross the high walkway, which is heated and – these days – completely enclosed, without actually stepping on the glass. But, if you did, you’d be missing the best part – as we were soon to discover. Tower Bridge doesn’t open very often so if you happen to be on the glass floor when it does, you are in for an unforgettable sight. We watched the slow majestic lift of the roadway to let a tall-masted sailing ship through, looking down on a view that no one had ever seen before in Tower Bridge’s 120 year history. The gleaming white under structure of the bridge roadway (the bascules to show off a little technical terminology) was one of several surprises about witnessing the bridge lift. Another, after the bridge lowered and the roadway was restored, was the ballet of traffic that commenced beneath it. First across were the cyclists, what seemed like hundreds of them. Then pedestrians flooded the walkways and finally the cars and vans. If you are careful, you can time your visit to see the bridge lift. A schedule of Tower Bridge lift times is published online. If you can’t make it for a bridge lift, just download the free Raise Tower Bridge app for smart devices. The app takes visitors through an augmented reality window in the glass, offering a 360-degree, panoramic video of the bridge being raised. You’ll be able to walk around and find different angles to look through. If you don’t have a smart device, assisted iPads are available on the walkways. The bridge opens. Click on the video link at the bottom of this post to see the full impact with tall ships, ferries and riverboats passing below. And here’s an interesting aside. If you are traveling up or down the Thames in a very tall ship, you can book a bridge lift for your boat for free. Bridge lifts for any ship with masts or superstructure more than 30 feet tall can be booked 24 hours a day, 365 days a year. But before you pick up the telephone, you’d better check that you meet all the requirements for a Tower Bridge lift. The £1 million glass walkways, funded by the Bridge House Estates and the City of London Corporation, are the first major changes to the Tower Bridge Exhibition since it opened in 1982. Also part of the exhibition are the original steam mechanisms that lifted the bridge when it was created, in the 1890s. The exhibition includes interactive touch screens that explain the modern operation of the bridge. Tower Bridge, the creation of architect Sir Horace Jones and civil engineer Sir John Wolfe Barry (youngest son of Sir Charles Barry, chief architect of the Houses of Parliament) was opened to the public in 1894 by the Prince and Princess of Wales – the future King Edward VII and Queen Alexandra. Exhibition Entrance: the West side of the North tower. Prices: In 2018, Adults £9.80, Seniors £6.80 Children 5-15 £4.20 Children under 5 free. Children under 15 must be accompanied by an adult. 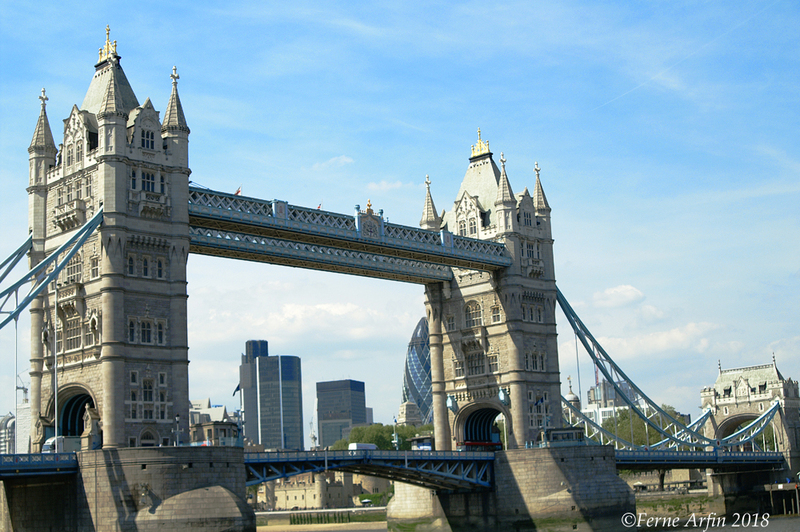 To Get There: Nearest London Underground stations are Tower Hill or London Bridge. Tower Gateway Station is the nearest mainline train station. And for a special treat, why not take a Thames riverboat. Boats stop at St Katherine’s Pier and Tower Pier on the north bank and at London Bridge City Pier on the south bank. All are within a short walk of Tower Bridge. * FULL DISCLOSURE STATEMENT: If you use links on this page to book tickets or services, I will receive a small amount of money, at no extra cost to you, to help fund this website. I would love to explore those walkways! London is such a gem.. Love going there each time. I think this is the first blog that has truly told me something new about my home city (that I left in Jan). Fascinating and I’ll definitely be doing this when we go home to visit. Thanks. So happy you liked the post. Hope you get to visit soon, it really is amazing. That’s cool! 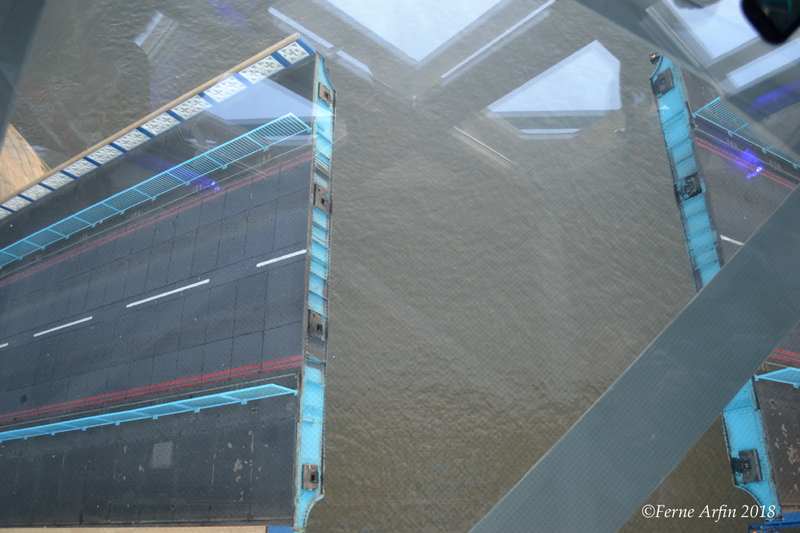 I went up Tower Bridge back in 2007 when I was in college but I love that there’s now a glass floor!